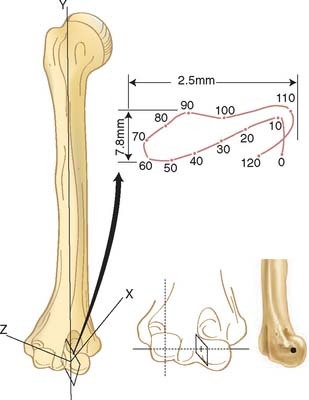 The elbow joint motion is often considered a pure hinge joint, but 3D studies of passive motion have demonstrated that the kinematics should be considered as a modified hinge joint, with a helical type of motion of the flexion axis. This is due to the oblique surface of the trochlear groove along which the ulna moves. An electromagnetic sensor study demonstrated that the amount of potential varus-valgus and axial laxity that can occur during elbow flexion is about 3 to 4 degrees. Fisher (1909) used a 2D technique called Reuleaux’s method to estimate the instantaneous center of rotation to be 2 to 3 mm in diameter at the center of trochlea. Subsequent studies have demonstrate this area to be larger in the range of 3 to 8 mm as shown below (Chao and Morrey 1978).